Robyn – EYFS - for amazing sentence writing. Joshua – Yr 1 – for doing some absolutely fantastic writing. Lillie – Yr 1 – for doing lots of fantastic independent writing. Harlee – Yr 1 – for fantastic independent writing. Arthur – EYFS – for fantastic effort and knowledge in phonics and writing. Matthew – Yr 6 – for exceptional writing and amazing vocabulary. WILF will be visiting class 3 for 99.6% attendance. Jessica will be visiting class 14 for 99.5% attendance. Class 5 were also amazing in 3rd place with 99.4%. 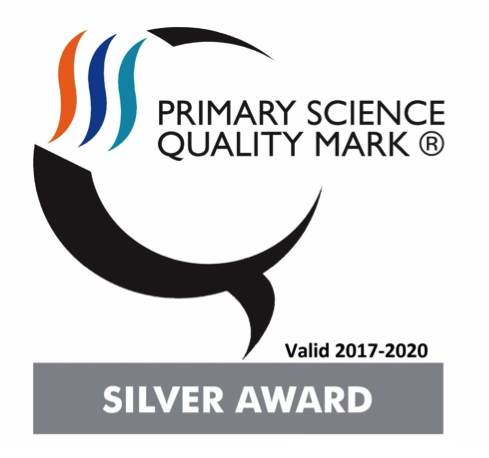 What a great start to the week by receiving a notification about school being awarded with the silver award for the Primary Science Quality Mark (PSQM). In September, Primary Science Quality Awards were awarded to 347 infant, junior, primary, middle and special schools to celebrate a commitment to excellence in science teaching and learning. The Primary Science Quality Mark is led by the University of Hertfordshire, School of Education in partnership with the Primary Science Teaching Trust. It is supported by the Royal Society for Chemistry, the Ogden Trust and the Association for Science Education. I would like to thank Mrs Lisa Clarke for leading on this area of the core curriculum over the last two years and co-ordinating Science extremely well since she joined the school in 2015. I would also like to thank the staff for their contributions towards the collation of evidence for the award and, of course, the children in their enthusiastic contributions to science over the years and this term. In addition, I thank Antony Pailing for his link with science across school as a parent governor. A great celebration and something to be very proud of in school this week. Over the next term, Mrs Clarke will be creating a display within the school hall for science work, which has been given our ‘Science award’. Let’s go for Gold! Well, the week ended brilliantly with our ‘Spotacular’ theme, and very own fashion show, in honor of Children in Need. The children wore their spottiest clothes and were very ‘mismatched’ as advised. The results were amazing and we had so much fun today in school. Goldbook was certainly the brightest and most colourful that we have seen for a long time. 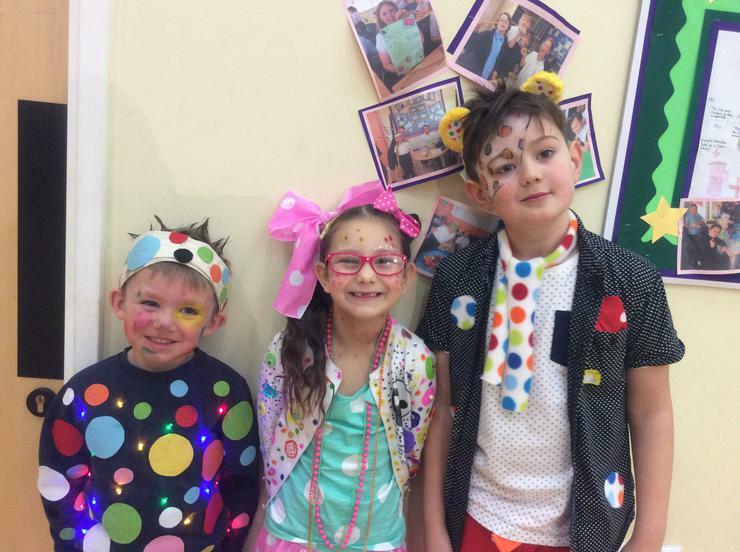 Throughout the day, each class voted for their two favourite ‘spottiest’ pupils, and these children went head to head in a fashion show in front of the school during the morning. I was also VERY impressed by Jonah’s cat walking swagger, spotty face and bow-tie and Riley’s costume and homemade spotty collection tin. TRULY brilliant! 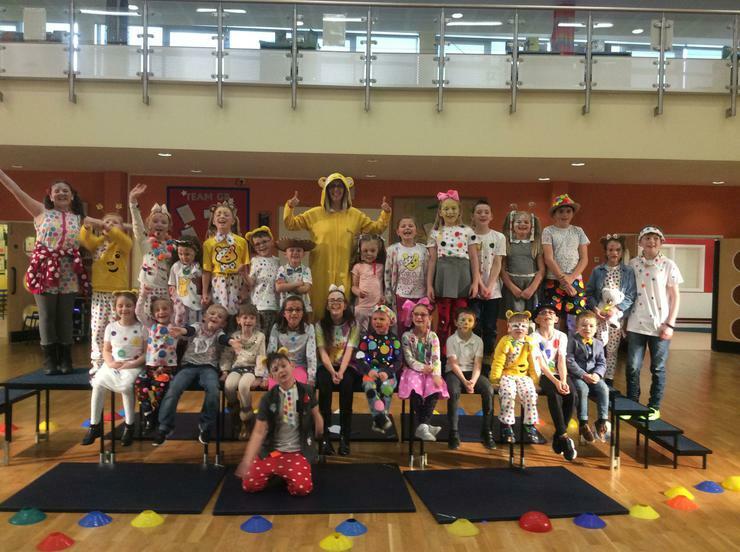 I thoroughly enjoyed being Pudsey Bear for the morning and demonstrating how to strut on the cat walk…all the teachers did too! What a great morning of fun, whilst also showing the children how to raise the profile of charity work and how to help people, who may be less fortunate than ourselves! A great day was had by all the staff and children and we are pleased to have raised £265 for Children in Need. We are very proud! A huge thanks to Miss India Marvin for organising the event, fundraising, fashion show and theme. The year 2 children ended their day brilliantly also with a theatre workshop related to The Great Fire of London. They were very excited and had a super learning experience. Another fantastic day at Greasley Beauvale Primary with Team GB and the wonderful children! Enjoy your weekend and see you all soon.